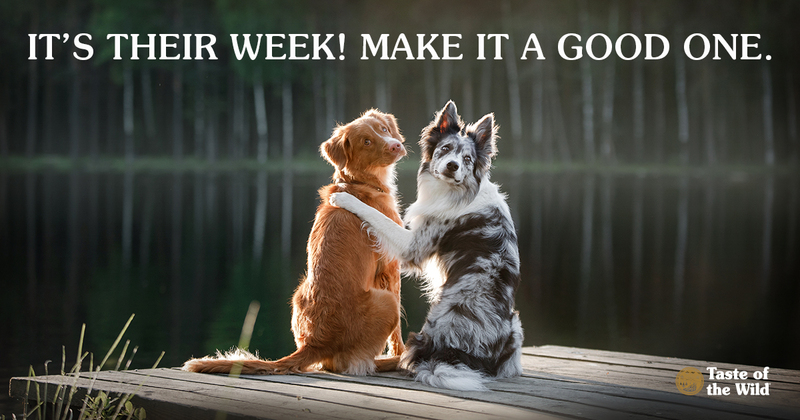 “The world likes dogs because dogs are nearest to moral perfection of all living things,” according to Captain William Judy, who founded National Dog Week in 1928. Commit to Daily Walks (if you haven’t done so already). Short of begging for cheese, is there any activity your dog adores more than walking with you? The mere mention of the word “walk” will no doubt have your dog quivering in anticipation at your feet. Whether it’s a hike in the woods or a short stroll around the neighborhood, daily exercise is good for your dog’s health — as well as for yours. Walks give your dog the opportunity to read “peemail” from other canines, meet new people and just spend quality time with you. Can’t get away from work? Hire a dog walker to stop by your house or drop your pup at doggy day care for a play date. Donate to a Local Shelter or Dog Rescue. There are lots of dogs out there waiting for forever homes. You can help get them there by donating time, money, food, beds, towels or other items — just contact the organization and ask what they need most. You can also volunteer to foster a dog (that is, if your dog is OK with it). Fostering is a great way to open your home and your heart to a dog in need. And who knows, it could turn out to be a great playmate for your own dog. Take a Dog-Friendly Vacation. There’s no better time to hike in the woods or jog on the beach. And who better to join you than your loyal canine companion? With so many hotels and rental homes that are happy to accommodate dogs, it’s easier than ever to explore the world with your pooch. Schedule a Health Checkup. While a visit to the veterinarian probably isn’t your dog’s favorite activity, it does provide you with the peace of mind that you’re doing everything to protect your pet’s health. In addition to performing a physical exam and possibly laboratory work, your veterinarian can advise you on nutrition, behavior and other factors that can help prolong your dog’s lifespan. It’s also a good time to consider investing in pet health insurance so you won’t have to think twice about getting medical help when it’s needed. Splurge on Something Special. Why not throw a “dog party” and invite your pet’s canine pals for supervised Frisbee throws, a dip in the kiddy pool and homemade dog cookies in your backyard? Maybe now’s the time to adorn your walls with a professional photo or painting of your pooch. Or simply buy your dog a new toy and devote time to a game of fetch.